If you enjoy fresh homemade meals and everything done from scratch...this is the place. Restaurant makes their very own preserves that come with all their dishes, pancakes are fluffy flavorful, mimosas, wine and very good list of craft beer. Needless to say their menu ranges from traditional American and Mexican and things in between. Customer service and waiters are very friendly and will check up on you often, chef will also come to make sure everything is delicious. For my first time here with my sisters and family I was blown away. So many good things from this location that I'll probably be back tomorrow again. Definitely that "everyone knows your name" place. My waitress, Deborah, was very friendly. The food is excellent. I had the bacon-cheddar omelet and it was delicious. I think I may have found my new place for breakfast before church. The service here is absolutely excellent! Our waitress was very friendly and checked in on us pretty often. And the owner was so hospitable. But the most importantly the food was phenomenal, my sisters and I went in and ordered a couple of dishes to share, so we could try a little bit of everything on the menu. And it was all fantastic, can't wait to go back and try more! Delicious, local, breakfast spot in Tustin! Kinda of a hole in the wall because it's located in a small shopping center. Great food, reasonably priced, and great service. The owner walks around greeting people and making sure everything is on par! This was a nice little find for some quality home-style breakfast. In an age where people make their dining choices based more on the Instagram worthiness of the food rather than taste, it's refreshing to see a small business that still puts value in the basics. This place serves up generous plates of all your breakfast favorites in a clean and appetizing way, without any of the unnecessary frills. You won't find any fancy benedicts stacked with pork belly here and the spartan interior just doesn't compliment a good duck faced selfie. But what they do offer is a solid country fried steak and eggs, served with a friendly smile. First time going and I ordered the PCH sandwich and it was AMAZING! So delicious. The fries are honestly the best fries I've ever had. The owner is so nice and very welcoming. He went up to my table twice to make sure we were well taken care of. His story on opening this cafe is truly inspiring. I can't wait to go back next week. Friends Cafe knows there way around a scramble!!! I couldn't think of a better intro to display my pleasure, maybe it's writers block or maybe there simply aren't words to describe how delicious the spinach Florentine truly is. This dish combines tomatoes, spinach, Swiss, and bacon that works on so many levels. Each bite was bursting with flavor, the tomato was in perfect unison with the cheese and the bacon. I was truly witnessing a pleasure symphony inside my mouth. As for the sides you get a few options but I decided to keep it simple and go with the hash browns and toast. This was a good call because even though these are traditional sides they were prepared to perfection and really ample in size. I went to this eatery 2 days in a row I was so impressed. I highly recommend giving them a try, they have all their bases covered!! Delicious food and amazing service! We were seated within 10 min of our reservation, we didn't have to wait until our entire party arrived. The food was hot, delicious and our drinks were replenished consistently. The waitress and manager were so gracious and we enjoyed every minute of our brunch. Excellent service, very friendly and professional. Food is exceptional. Pancakes are amazing and HUGE!!!! Everything was cooked perfectly. 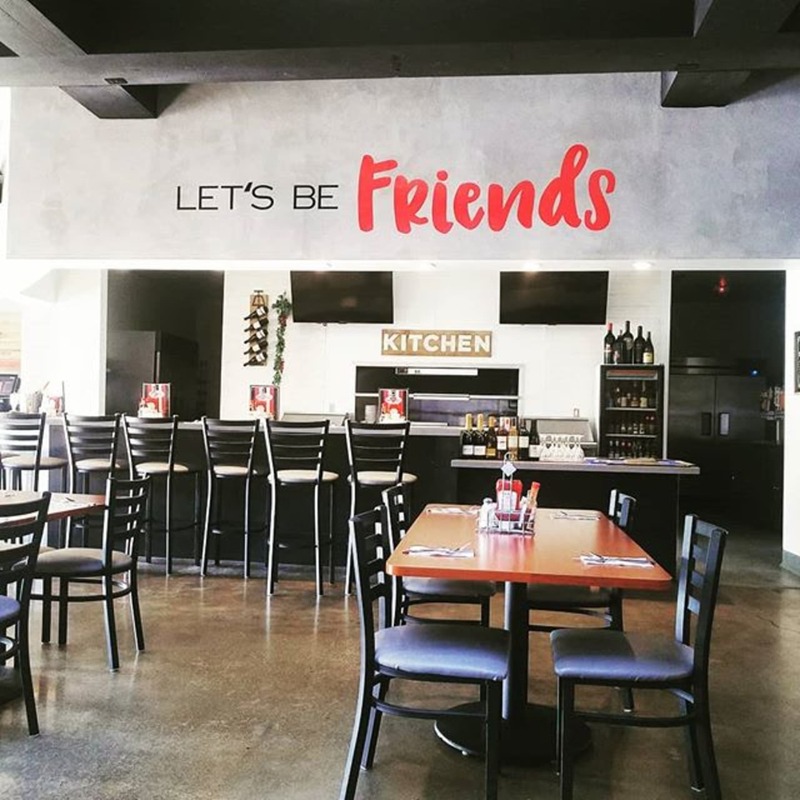 We are definitely coming back to friends cafe! We love eating at Friends! The staff is so friendly and they work so hard. The owner is really nice too, he is around a lot. Their breakfast is amazing, I love the waffles. I also enjoy their lunch menu. I haven't been disappointed yet. It's easy, delicious and reasonably priced. I take all of my friends here when they come to visit. Such an absolutely fantastic little cafe! Came here on a Saturday morning and it wasn't too busy. Once we left it started to pick up though. The staff is friendly and helpful- the chief even came out to ask how the food was. Saw him also help serve the food at some point. The food is brilliant. Had the Vegetarian Omelette with fruit and it was so good! Reasonably priced and great service is a perfect combo.